“And they are so not in your color wheel,” she said sympathetically. “But you can’t,” she said. The offending piece of attire we were bashing? My Big Girl Pants. I was not in the mood to put them on. I knew I had to, but that did not stop me from whining about it. The Big Girl Pants are never a welcome sight in my world because they signify a looming cross that I will need to take up and carry. I had hoped that I had successfully avoided the need to don the Big Girl Pants for a short time, all the while dreaming that it was a permanent separation. Nope. They were back. They were insistent. And they were definitely accompanied by a cross. We all have crosses to bear in this life. I often tell my seminar attendees that Jesus did not say, “Pick up your Ghirardelli chocolate bar and follow me.” Or, “Pick up your new car and follow me.” Or “Pick up your lotto winnings and follow me.” No, sorry. He specifically said, “Pick up your cross and follow me.” And, because they are crosses and not feather pillows, they are uncomfortable. They are heavy. They can even hurt. We don’t want to pick them up at all, much less carry them around for any significant length of time. Lucky for me, the Creator of the Universe is used to my brazenness and has an endless supply of compassion and mercy to offer whenever I’m wallowing in the pothole of self-pity. He gives me time to adjust, and then he miraculously and generously pours out all the grace and strength and perseverance and courage I will need to carry my cross. He picks me up out of the pothole and helps me get into those Big Girl Pants. He’s done it before. Every single time, in fact. And I need to trust that He will do it again. He will not abandon me. And if I allow Him, He will also show me the good that comes from all of this. So off I go now, shouldering my invisible, yet undeniably burdensome cross. 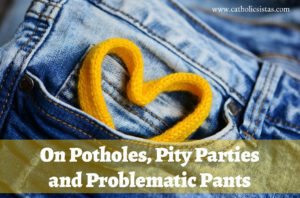 But by the grace of God (and some also-invisible, divinely woven Big Girl Pants) I hope to accept and carry my cross in a more peace-filled manner, and avoid the potholes and pity parties along the way.